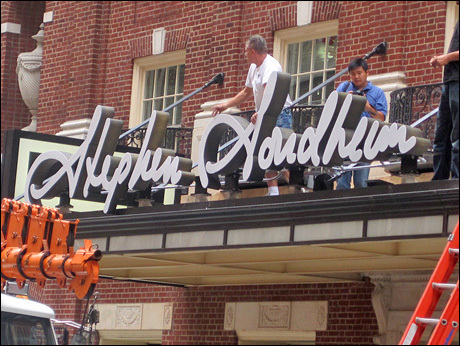 Workmen were seen putting up the marquee signage for the newly christened Stephen Sondheim theatre on Sept 10. Named after the famed Broadway composer, (my all time favorite) the official lighting up ceremony will occur on Sept 15. Wish I could be there. The theatre was formerly the Henry Miller’s theatre It opened in 1918 under that name. Over the years the venue has been a legit house, nightclub, cinema, and an x-rated movie house. 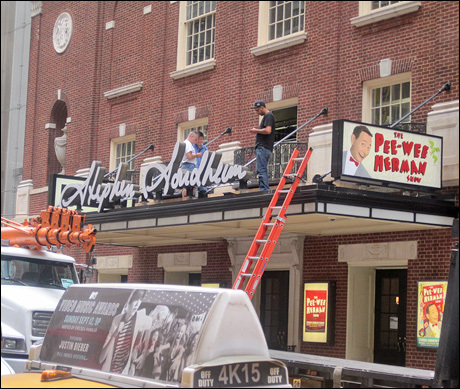 Kind of funny that the first production to play the theatre under the new name will be “The Pee Wee Herman Show”. If you recall back in 1991, Paul Reubens, the creator of Pee Wee was arrested for indecent exposure in an adult theatre. The theatre is located at 124 West 43rd Street, between Broadway and 6th Avenue.